With many state governments targeting historic renovation as a means to preserve history and a cost-effective source of local economic development, Pioneer Group became solidly involved with historic redevelopments and has earned a reputation for developing winning solutions for historic structures. Our initial historic preservation project involved converting a historic hotel, eleven historic apartment buildings, and a historic mansion into an affordable housing community. We soon found there was an abundant supply and an unrecognized demand for renovating historic buildings in a manner to put them back to good use for a number of other purposes. We helped Sterling College preserve Cooper Hall, which was built in 1887 and served as the original classroom building for the college. The building is now being used as home for a new academic program, the college chapel and quarters for visiting lecturers. Our historic preservation work with Cooper Hall recently received an Award for Excellence from the Kansas Preservation Alliance. While the Sterling College project was in process, Pioneer Group successfully negotiated a 75-year Enhanced Use Lease from the Veterans Administration for 38 vacant and under-used buildings situated on 72 acres of the VA's hospital campus in Leavenworth, Kansas. All but one of these buildings are historic with most of them having been constructed in the 1880s, originally to house Civil War veterans. We are using this innovative public/private venture to preserve the historic buildings and to use them in a manner to improve veteran services, reduce VA's operating expenses, and maximize the benefits to the VA and the Leavenworth community. Another growing area of our historic preservation efforts involve converting vacant school buildings into housing. Two recent projects of this kind also have received special recognition. 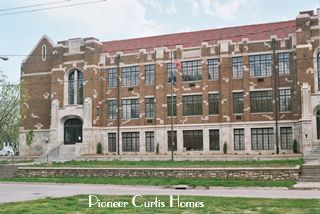 One recent project saved Curtis Junior High from the wrecking ball. Our historic preservation efforts converted this historic building, closed in 1976 by the Topeka Board of Education, into 35 units of senior housing. The Kansas Preservation Alliance also acknowledged our Curtis Junior High project as an Honorable Mention for its 2005 Award for Excellence. The next year we successfully undertook a similar project using the Roosevelt and Lincoln school buildings in Salina, Kansas, and the Kansas Preservation Alliance awarded Pioneer Group the 2006 Award for Excellence.